Persistence Market Research presents a comprehensive report on the next generation centrifuge market titled ‘Next Generation Centrifuge Market: Global Industry Analysis and Forecast (2017-2025)’. 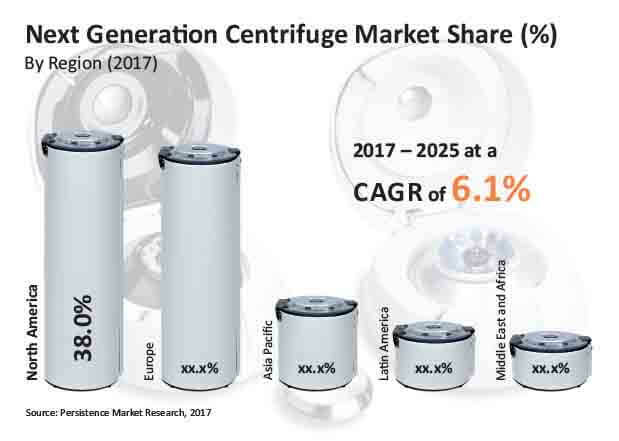 The report begins with an executive summary which has the important market numbers related to the next generation centrifuge market such as the market values for the year 2016 and 2025 and the most attractive product type, region and end user in this market. The executive summary also gives a concise list of drivers, restraints and trends operating in the next generation centrifuge market that are dealt in detail in another exclusive section of this report. The executive summary also has a list of prominent players operating in the next generation centrifuge market. In another part of the executive summary, the next generation centrifuge market value share for the year 2016 by product type, by end user, by refrigerated centrifuge and by ambient centrifuge are stated. Overall market size has been analyzed through historical data, primary responses, and public domain data. Revenue of companies in the global next generation centrifuge market has been benchmarked to ascertain the market size for the base year. Macroeconomic indicators such as GDP and industry growth have been considered to forecast the market size over the forecast period. The historical growth trend of end-use industries, market participants’ performance, as well as the present macro-economic outlook has been taken into consideration for estimating the overall market trend forecast. This data is then validated using the triangulation method and is extensively scrutinised using advanced tools to garner quantitative and qualitative insights into the next generation centrifuge market. The global next generation centrifuge market was valued at US$ 815.4 Mn in 2016 and is projected to register a CAGR of 6.1% in terms of value during the forecast period (2017–2025) and be valued at nearly US$ 1,380 Mn by 2025. The increasing advancement in clinical and medical fields has increased the awareness for the need of a better healthcare system. Various government amendments for research and development and diagnostic services is expected to enhance the growth of the next generation centrifuge market during the forecast period. Increasing government initiatives to develop access to healthcare is expected to play a key role in the growth of the market. The S10 Instrumentation Program is one such program initiated by the National Institute of Health (NIH) that allows NIH-supported investigators to purchase or upgrade a single item of specialized or commercially available instrumentation or an integrated system that costs at least US$ 100,000. High-end instrumentation grant program of NIH allows investigators to purchase a single major item of equipment for biomedical research that costs at least US$ 750,000. Various government initiatives in collaboration with other organizations to encourage R&D activities in the field of medical science is expected to boost the growth of the market. With the increasing requirement of centrifuges, companies are introducing systems with new innovative products with advanced features. The advanced centrifuge system called as the next generation system tends to overcome the problems related to the speed, efficiency and volume faced using the conventional centrifuge system. The next generation centrifuge system includes advanced features such as automatic electric brakes, solid state speed control, electronic tachometer and safety cut off switch to stop the system if the lid is open. The new generation centrifuge systems are microprocessor controlled smart centrifuges, which provide high efficiency with more memory storage. There is a high cost involved in the initial setup and installation of floor standing centrifuges along with the repair and service costs. Limited financial support to the organizations is a factor that poses a great challenge to the growth of this market. The chances of recovering the cost of the device depends upon the number of samples run in the system in hospitals for diagnosis as well as the number of end products achieved in research by an organization. Hence, achieving the break-even point for the system in an organization is quite uncertain. Also, the use of next generation centrifuges totally depends on the availability of robust medical facilities and platforms. The high cost of repairing and maintenance is also expected to hinder the growth of the market. Europe is expected to be the most lucrative market in the global next generation centrifuge market, with an attractiveness index of 1.9 during the forecast period. The Europe next generation centrifuge market accounted for 36% value share in 2016. The North America regional market is projected to be the second lucrative market in the global next generation centrifuge market in terms of revenue in 2017, and the trend is projected to grow throughout the forecast period. North America is the most attractive regional market, with an attractiveness index of 1.7 over the forecast period. Revenue from the North America next generation centrifuge market is anticipated to register a CAGR of 5.6% over 2017–2025. In terms of CAGR, Asia Pacific is anticipated to register the highest CAGR of 7.7% over the forecast period. Increasing research and development process in the pharmaceutical industry has increased the requirement of centrifuges in production and quality assurance processes and in research for drug development, to separate constitutes etc. With increasing competition, pharmaceutical companies are focusing on investing more on research and development. The requirement for drug innovation is important for both the improvement of healthcare and for organizational growth. The increasing patent cliff and rising microbial resistance to drugs creates an opportunity for research in the industry, thereby creating a demand for the use of advanced centrifuges in R&D.